Wed, 24-Apr-2019 - 19:21:27 ---- The fact: 42.844.000 visitors done. Surface treatment of tubes is necessary for many products. The type of the pre-treatment technology is different, depending on the different materials (carbon steel, stainless steel, non ferrous, etc). But there are many common aspects for the technical equipment, which is used for metal pickling processes. Due to the use of chemicals, which are more or less aggressive, the demands on the materials applied in plant design are high. The resistance to chemical as well as mechanical attack should be optimized. In order to reduce operational cost it is necessary to minimize also maintenance cost. Another important aspect of pretreatment lines is, to meet the requirements of environmental regulations, which will become more strict in the future. Following different solutions will be shown, how pre-treatment lines are executed today, in order to meet the requirements of the market and the environmental regulations. The new concept of encapsulated pre-treatment plants according the “KVK-System” from Koerner KVK will also be introduced. Are the main targets for this system. Following we will see an overview of different pre-treatment requirements, depending on the materials and on final use of the tubes. These kind of plants need a special type of technical equipment ,especially for the galvanizing process. The pre-treatment of the tubes is done by degreasing (in most plants), pickling and fluxing. The pickling chemicals, that are used are mainly HCl or H2SO4. In most of the plants the pre-treatment line is a traditional open system, mostly without any, or with poor measures for environmental protection. Tubes, which are manufactured according DIN 2391 or DIN 2393 require chemical pre-treatment prior to cold drawing. Pickling is only one step of the pre-treatment, which normally consists of degreasing, pickling, phosphating soap. The pickling chemicals are mainly H2SO4, but some plants use also HCl. Temperatures vary and depend on the pickling chemicals (H2SO4 at approx 70°C and HCl between 30 and 50°C), but also on the special know how of the companies. Plants for these products are designed either traditional (without fume extraction) or with lateral fume extraction on the pre-treatment tanks, which are operated at high temperatures and/or with aggressive chemicals. Only few plants are designed fully encapsulated (as for example Forster in Switzerland, or TAP - tubos de acero de precision in Spain). Pickling of stainless steel tubes requires very aggressive chemicals. A mixture of 2 or 3 componets acid is used in most of the companies. Pre-treatment plants for stainless steel are equipped with fume extraction equipment as well as different types of purification systems. In some plants the tanks are equipped with tanks covers in order to reduce the vapours. Also pickling processes according the autoclave system are used in some companies. These kind of pickling lines are sometimes very special and consist of few tanks only. 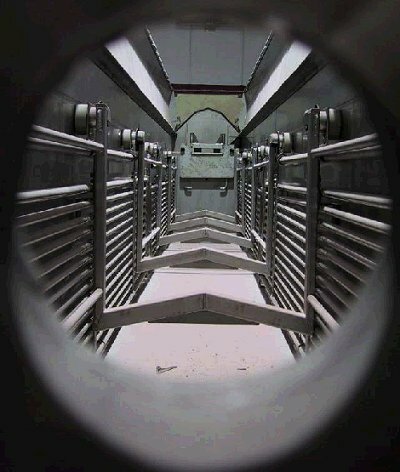 The plants for Titanium tube pickling are similar to stainless steel pickling lines, whereas pickling equipment for zirconium tubes is highly specialized and not used in other industries. In the description below focusses only on the technical key equipment of pre-treatment plants. The main difference between the different types of plants is the way of reduction of vapours and the way for fume purification. Other external equipment which can be used in any type of plant (by pipe connection to the tanks) like filters, deionisers, etc. are not considered here. This type of plant had been installed for decades and some of the plants are still in use without big changes. The different pre-treatment tanks are standing in a building and are not equipped with any fume extraction equipment. The disadvantages for this type of plant are obvious. The vapours and aggressive fumes will evaporate from the liquid surface and are distributed within the building. Steel structures, electrical equipment, etc. will be attacked and destroyed, resulting in high maintenance costs. The main target for optimising the pre-treatment section is to reduce the amount of vapours and aggressive fumes, which cause destruction of equipment (cranes, building, stored material, etc.). One option, which is realized in some plants, is to use only one pre-treatment tank, where the different processes (pickling, rinsing, etc.) are done by pumping the chemical from storage tanks to the operating tank and vice versa. These autoclave systems are equipped with covers for the tanks and with fume extraction systems. The most common way for reduction of fumes and vapours is to install fume extraction channels along the tanks. In principle there are two different types of fume extraction systems- extraction on both lateral sides or a “push’n pull” system, where only the air is extracted on one side and on the opposite side, there is a blowing pipe, which creates an air curtain above the liquid surface. The latter method needs approx 20% less extraction volume. If these systems are designed properly, they can catch most of the fumes while the material is immersed or without material. 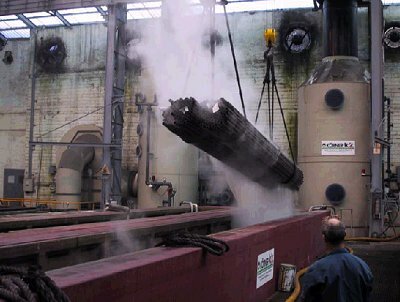 When the tube bundles are lifted after finishing the pickling process, a huge surface, which is wetted with chemicals, is exposed to the atmosphere. In this position, no lateral fume extraction system can catch the emissions coming from the tube bundle. The surface of the tube bundles is more than twice as large as the liquid surface of the pre-treatment tanks. The required extraction volume is rather high and cannot avoid that aggressive fumes can attack other equipment and the building. For most pickling chemicals it is necessary to clean the extracted air. The size of the purification systems (scrubbers in most cases) depends mainly on the volume of decontaminated air. The tanks used today are all free-standing and are installed in so-called installation pits (concrete troughs) which collect the chemicals in the event of a tank leak (caused by mechanical damage from falling parts) and prevent them escaping into the ground water. The working tanks are sturdy KVK tanks, specially designed for the tough operating conditions in pretreatment plants. The tanks are placed close to eachother in order to minimize the required space for pickling tanks. It should be considered, that it is of big advantage, if the tanks can be repaired in the operating position (that means without moving the tank) in case of damages. The tanks can be equipped with additional parts, such as jig supports for exact positioning of jigs on the tanks, or tube bundle separators. The greatest problem with respect to the generation of emissions is the "steaming off" of the acid when the material is taken out of the bath. As mentioned above, this effect cannot be solved by lateral fume extractions channels. The only way to solve this problem properly is to encapsulate the whole pre-treatment area. The Pre-treatment is enclosed using KVK panels. These panels are mounted on a steel or wooden substructure and coated on the working side with glass-fibre reinforced plastic to create a diffusion-tight, chemical-resistant shell isolated from the other production areas. 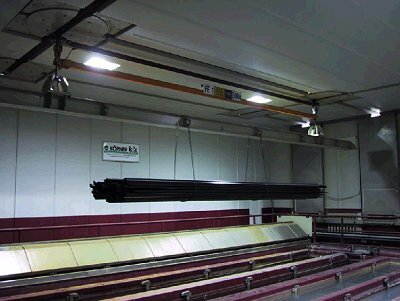 Since the cranes are running outside the encapsulated area, the ropes or chains enter the encapsulated room through slots in the ceiling of the enclosure. These slots must be sealed excellently in order to keep the fumes inside. In the “KVK System”, the tanks are placed side-wall to side-wall, making optimum use of the space available. The side-walls are glued together. This also ensures that spilt chemicals cannot drip between the tank walls into the installation pit. The areas alongside the tanks are fitted with walkways made of acid-resistant, non-slip KVK floor panels. The panels are mounted at the height of the upper edge of the tank and slope inwards to the tank chamber. This ensures that any liquid drips will flow immediately back into the correct tank, thus saving a considerable amount of chemicals. This arrangement of maintenance access panels divides the pre-treatment unit into two completely independent areas. The upper part (emission area, wet area) contains the aggressive fumes resulting from the high solution temperatures. 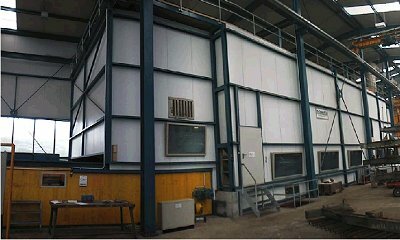 However, these fumes are prevented from escaping from the enclosed pre-treatment unit and from entering the floor area (cellar), since the KVK casing panels and the KVK maintenance access panels form a diffusion-tight shell. Since no chemicals or aggressive fumes enter the cellar part, the latter can be referred to as dry installation pit. The heating of the pickling liquid creates fumes in the emission area. However, these fumes cannot escape thanks to the enclosed design of the pre-treatment unit. It is absolutely necessary to create a negative pressure atmosphere inside the enclosure to guarantee that no fumes will escape from the pickling area. In the Koerner System, these fumes are continuously extracted through an extraction channel and fed to a scrubber unit for purification. The exhaust system is calculated specifically for each pre-treatment unit, since the complex interplay of casing volume, air-lock gate opening, arrangement of exhaust air lines, and the size and temperature of the bath surface make a simple design impossible. A big difference between lateral extraction and extraction of encapsulated systems is, that the volume to be extracted is much less in encapsulated system. For a complete pre-treatment line one needs to extract approximately only that volume, that would be necessary to extract two single tanks in open systems. This also the size of the scrubber can be reduced. The principle of the “KVK system” is very simple, but it might be very dangerous to install an encapsulated pickling line without knowing the criteria in the design and calculation. To design a modern system properly it was necessary to develop several calculation tools, that cannot be purchased on the market. Special know how and the possibility to compare the theoretical results with measurements in real plants, gave us the possibility, to adapt the software modules. It is essential, to calculate the complex interactions in encapsulated plants very closly to the real situation at the very beginning of the design of a project. Concentration of fumes inside the pickling area. This is necessary to design the scrubber in the correct way. Several parameters are influencing this figure. To avoid fog inside the enclosure is essential. The climatic conditions need to be considered very carefully, too. It must be guaranteed, that no fumes are escaping. The critical time is, when doors are opened. Due to thermal gradients and inhomogeneous flow conditions inside the enclosure, complex flow calculation programs are required. Several patented inventions are incorporated in the design of modern encapsulated plants. For the design of modern plants it is necessary not only to consider new technical and technological aspects, but at least as important the optimum material logistic. A profile on required standards as well as technological issues needs to be developed. It is helpful, if the supplier of the chemical process is also involved in this discussion. The planned quantities of material, procedural steps and timelines have to be described systematically. The next step is to analyze this fundamental data and integrate it into a new design. The first step in this action plan is to prepare a grouping from the materials mixture of the product that is to be produced, allowing the various products to be condensed into a similar sequence of procedures. The outcome of these analyses are various process groups, for which the chemical treatment operating sequence is similar. The next step is to structure these procedural sequences for the respective material grouping so that on the one hand an uniform direction in production without bottlenecks can be guaranteed, and on the other hand, an optimum arrangement for incorporating automatic transport systems can be found. 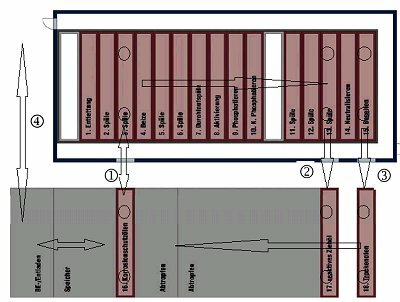 The result of these findings is the optimum configuration of process baths with respect to (minimum )conversion times and (optimum) turn-around times. Experiences were integrated along into this new design after visiting several facilities of reference. The final and individually customized design is realized on the basis of these findings and experiences from both, the supplier and the customer. In principle there are 2 different possibilities for encapsulated systems to enter and to leave the pre-treatment area: crosswise or lengthwise. An example for material flow is outlined in a schematic drawing picture 7. Bundles of tubing are transported by a conveyor system to the loading and drop-off stations. The bundles are attached to carrier support beams secured with a harness strap. These carrier support beams sit on specially prepared pick-up points and can be operated fully-automatically by the transport system. The second part of pretreatment essentially consists of oil baths, storage and dripping stations and is set-up outside of the encapsulated system. A dryer is also located in this area. It is possible to bring in the material either by shuttles or with monorails, where turntables change the direction of transport. Picture 8: Encapsulated plant with lateral material access. In this system the tube bundles are taken over to hand over positions outside the pre-treatment area. A hand over system (mainly chain conveyors) move the material into a position, where the transport unit, that work for the pre-treatment, can take them over. The transport units for the pre-treatment are running outside and are not exposed to aggressive fumes at any time. Picture 10: Crosswise plant in real operation. Encapsulated pre-treatment lines can be operated manually, as well as automatically. For automatic systems, the carrier support beams are transported from the loading and drop-off points to the storage positions. The transport technology will then take them from there as specified by the downstream processing control system and lead them through a sliding door into the encapsulated pretreatment area. Material identification as well as individual processing sequences are defined at the beginning of the operational procedures and sent over to the respective transport unit via a process control system. This process control system optimizes the operating sequence for the chemical pre-treatment, in order to ensure optimum turn-around for various products as well. 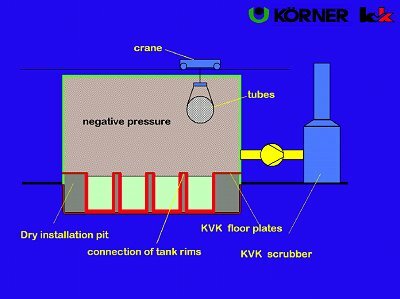 Koerner KVK has developed a system, where standard overhead cranes can be used for the encapsulated pre-treatment. For this new development it is possible, that the bridge cranes are running outside the pre-treatment area and are never exposed to aggressive fumes. If a plant should start with manual operation the savings for the initial investment can be significantly, if the standard cranes can be unemployed used. This system enables the customers to get full advantage of an encapsulated pre-treatment plant, while future modification to an automatic system is possible. The ever-increasing pressure of competition must be met by new ideas for system techniques and technologies. In order to reduce production costs, every stage in the production process must be optimised and all system components optimally adjusted to each other. There are many different options to reduce the problematic fumes in pre-treatment lines. 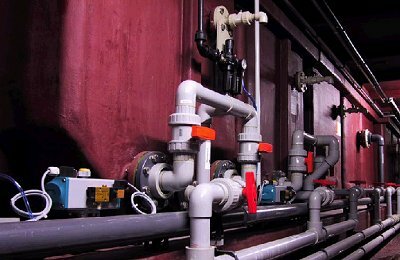 Since lateral fume extraction systems on pre-treatment tanks cannot avoid, that aggressive fumes attack building and equipment, further fully encapsulated systems for the pre-treatment plants seems to be the future design. 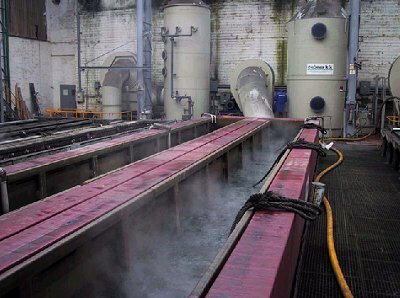 By fully isolating the pre-treatment from other production areas, it is possible to operate the baths at high temperatures without corrosion in the rest of the production area. This systems can be operated manually or fully automatic, which reduces labour costs and as far as possible eliminates the human factor as a source of errors. Enclosure prevents the escape of aggressive fumes from the pre-treatment unit, thus preventing corrosion on crane equipment and building. The design of encapsulated systems requires a lot of technological know how and special knowledge in process engineering as well as thermodynamics and fluid dynamics. The encapsulated pickling plant according the “KVK-System” is running in more than 20 plants all over the world.